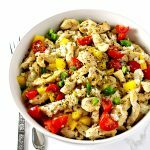 This Chicken Cauliflower Rice Bowl is a delicious, spicy paleo dinner recipe the whole family can enjoy! 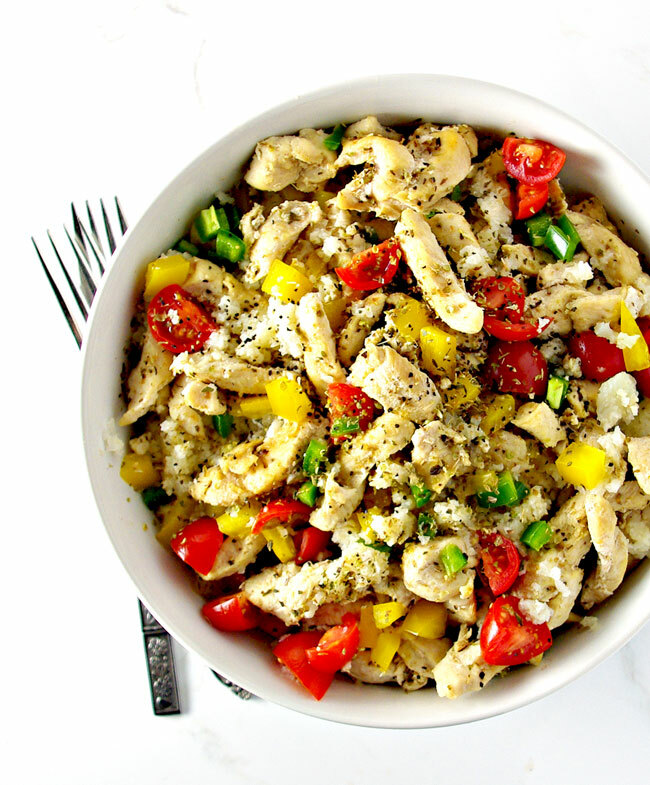 Flavored with cumin, oregano, peppers, and jalapeños, this meal is anything but boring! And there are countless add-ons and mix-ins you can include to customize it even more! Friends, we did it again. Our family taste-tested this spicy recipe and then, much like with Broccoli Beef Stir-Fry, we just dug into the bowl and ate family-style. That is if family-style includes sharing the same bowl and only taking a break from delicious bites when absolutely necessary. You guys, I don’t know about you, but I am here for cauliflower rice that’s paired with bell peppers, jalapeños, cumin, oregano, and tomatoes. It’s the kind of meal I’m showing up for. And that’s basically how I am wading my way into warmer weather. I also feel like this is a recipe you can absolutely take up as many notches as your heart desires. For example, you could go next-level and add a little cumin and oregano to your cauliflower rice as it cooks. 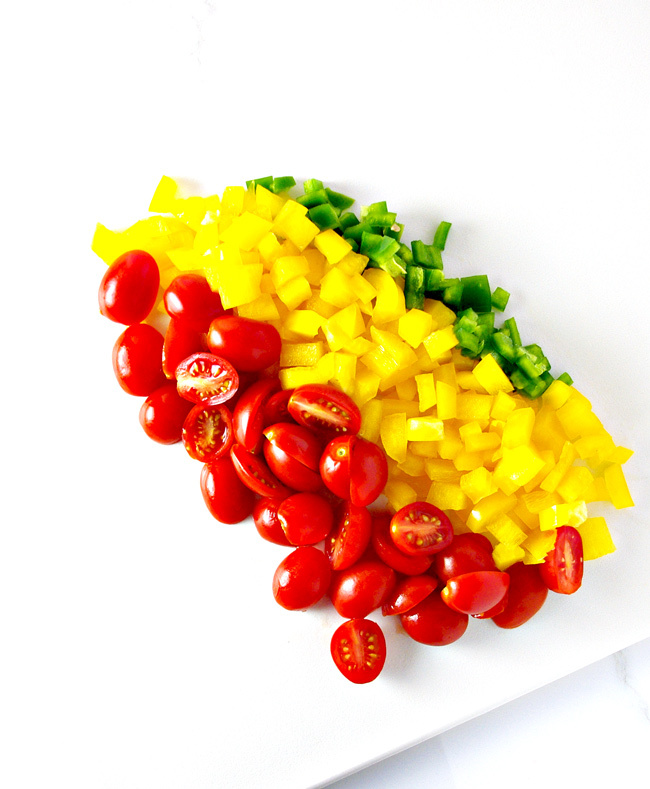 You could also add fresh lime juice and cilantro or even a few chilies. Who are we even? Certainly not the Boringtons. While actual amounts will vary, depending on the size of the head of cauliflower used, I’d say this meal will comfortably feed about 3-4 people. So if you’re in the mood to flavor it up for dinner, then keep on reading, and let’s make a batch of this for ourselves! Below are ingredients for how to make your very own Chicken Cauliflower Rice Bowl recipe! Cauliflower and chicken. I start with the cauliflower rice, chopping the cauliflower florets into rice-like pieces, about 5-6 pulses on my little chopper. If there are stubborn pieces that refuse to break down, I remove them from the current batch and add them to the next round. As for the chicken, I start sautéing it while the rice is cooking. If the chicken finishes sooner than the rice, then I cover it in the skillet and set it aside. Coconut oil, sea salt, cumin, and oregano. While I typically steer clear of large amounts of sea salt, when I’m making cauliflower rice, I find more sea salt actually tastes quite good. It gives the cauliflower a richer flavor, and it pairs well with the coconut oil. The cumin and oregano take what might otherwise be a boring rice dish to new realms. The combo is so good! Grape tomatoes, jalapeños, and bell peppers (any color will do!). These mix-ins and toppings add just the right amount of juicy flavor, spicy heat, and succulent textures to the dish! You can also add in cilantro, lime, avocado, black olives, and chilies to the recipe. Mix and match for the combinations that taste best to YOU! Variation: For extra flavor, you can also add a little cumin and oregano to the cauliflower rice as it cooks. In that case, decrease the sea salt used by about 1/2 than what the recipe calls for and only add more sea salt if desired. 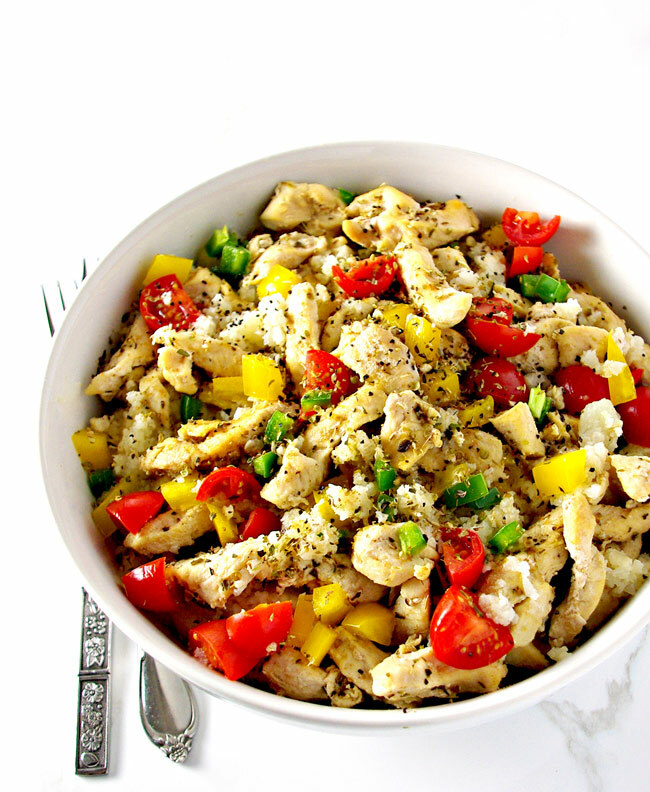 Below are steps to make your own Chicken Cauliflower Rice Bowl. Break the cauliflower into florets, removing the stems, and chop the florets in batches in a chopper, until they turn into rice-like pieces. Remove stubborn pieces and add them to the next batch, but do not over-chop the florets or they’ll turn mushy while they cook. Add the chopped cauliflower rice to a large sauté pan with 6 tablespoons of coconut oil and 1 teaspoon sea salt. Sauté covered on a low to medium heat until the rice granules are tender but not mushy. Cooking times will vary, but this process will take anywhere from about 10 to 15 minutes. Stir frequently and check often to prevent the cauliflower from burning or softening too much. While cauliflower rice is cooking, sauté chicken strips in a separate skillet with the remaining 2 tablespoons of coconut oil. Once the chicken is cooked through, then add the cumin, oregano, jalapeño, and bell pepper and cook for about 3-5 minutes, or until ingredients are warmed through. Transfer rice to bowls and top with chicken mixture. Add additional ingredients such as cilantro, lime, avocado, black olives, or chilies as desired. NOTE: If either the cauliflower rice or the chicken finishes cooking before the other, simply cover it and set it aside until the other is done. Break the cauliflower into florets, removing the stems, and chop the florets in batches in a chopper, until they turn into rice-like pieces. Remove stubborn pieces and add them to the next batch, but do not over-chop the florets. Add the chopped cauliflower rice to a large sauté pan with 6 tablespoons of coconut oil and sea salt. Sauté covered on a low to medium heat until the rice granules are tender but not mushy, about 10-15 minutes. Stir frequently and check often to prevent the cauliflower from burning or softening too much. While cauliflower rice is cooking, sauté chicken strips in a separate skillet with the remaining 2 tablespoons of coconut oil. Once the chicken is cooked through, then add the cumin, oregano, jalapeño, and bell pepper and cook for about 3-5 minutes more, or until ingredients are warmed through.